After launching the updated Pulsar 150, Pulsar 180 and the Pulsar 220F, Bajaj have now introduced the Pulsar 180F as well. This is the first time that Bajaj has added a new motorcycle to the 220F lineup. According to the sources, the new semi-faired Pulsar 180F is priced at Rs 86,500 (ex-showroom), which makes it Rs 2,500 more expensive than the naked variant. For those of you who still didn’t understand the Pulsar 180F is essentially the same Pulsar 180 with the 220F body kit. Although the Pulsar 180F looks almost identical to the 220F there are still few visual differences which help it differentiate from the latter. For instance, the Pulsar 180F still retains the old exhaust canister of the naked Pulsar 180 which is slimmer than the exhaust of the 220F, while the graphics too looks slightly different than the original 220F. 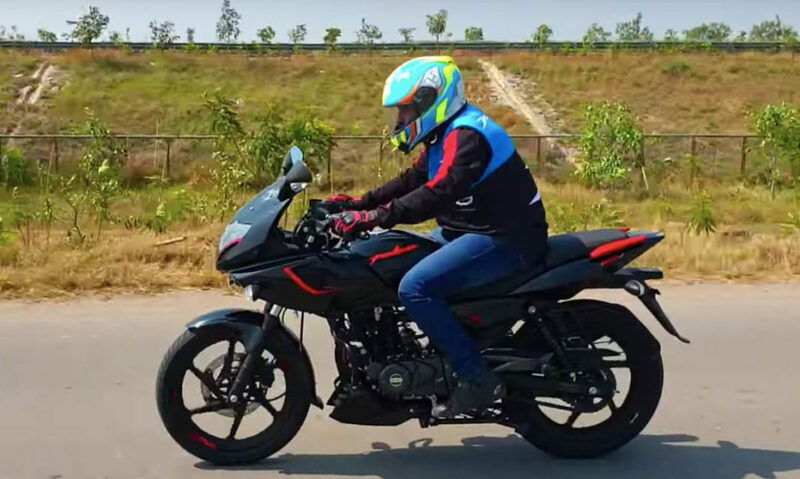 Unfortunately, Bajaj hasn’t yet added the ABS safety feature on the Pulsar 180F but we are pretty sure that the motorcycle will receive the ABS update before the April 2019 deadline. The Bajaj Pulsar 180F uses a 260 mm front disc and 230 mm rear disc. The sizes of the brakes are identical to the ones found in the 220F. The motorcycle even features a steel braided line instead of rubber found in the Pulsar 180 which has definitely improved the braking capability of the motorcycle. In this video, you watch the rider is able to bring the Pulsar 180F to a halt from 68-0 km in just 2 seconds. The motorcycle also sounds a little different than the standard Pulsar 180. As far as the engine is concerned the Pulsar 180F is powered by the same 178.6 cc, single cylinder air cooled engine which is capable of producing about 17.02 PS of peak power and 14.22 Nm of peak torque. The engine is paired to a 5-speed gearbox. You can watch in this video the rider said that the throttle response of the motorcycle has also been improved while the clutch is also lighter now. Along with the refined engine, the Pulsar 180F also gets an improved seat cushioning while the light throw and illumination are also improved thanks to the new 55W dual projector headlamp setup. Although Bajaj has not made any official launch announcement of the launch yet we are pretty sure that they will launch this new motorcycle within the next few days.